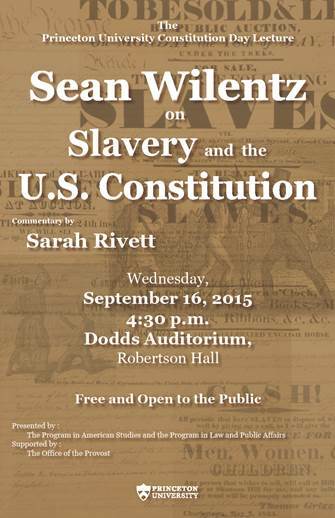 Sean Wilentz, the George Henry Davis 1886 Professor of American History, at Princeton University, will deliver “Slavery and the U.S. Constitution,” Princeton’s Constitution Day Lecture, on Wednesday, September 16, at 4:30 p.m. in Dodds Auditorium, Robertson Hall. Sarah Rivett, an Associate Professor of English specializing in early American and eighteenth-century transatlantic literature and culture, will comment. The event is free and open to the public. More information is here.